April 6 – On this date in 1974, the Swedish band ABBA won the Eurovision Song Contest with “Waterloo.” The band would quickly become worldwide superstars and they’ve gone on to be one of the most successful international bands in history. And then, just as it seemed their fame was about to diminish, a hit musical introduced them to a whole new generation. ABBA came together as a singing group in 1972 in Stockholm, Sweden. They were made up of two couples. By taking the first letter of each of their first names they formed the word ABBA, which they chose as their band’s name, often writing it with the first B backwards. In the 18-year history of the Eurovision competition, a Swedish band had ever won, but ABBA broke that streak, beating a tough field of artists that included Olivia Newton-John who competed for England. 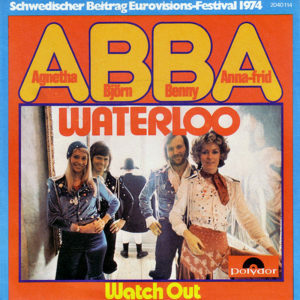 Soon ABBA’s “Waterloo” was released in the U.S. and went to #6 on the pop chart. A year later, they had back-to-back Top 20 hits with “I Do, I Do, I Do, I Do, I Do” and “SOS.” Then in 1976, with disco music dominating the pop chart and dance floors of America, ABBA released “Dancing Queen,” which went to #1 in April of 1977. Wedding Couples Be Sure To Avoid Mayhem!